Iconic retailer B&H uses HDBT AV distribution system for high-end demonstration of TVs, projectors, & surround sound. Most consumers need to see the latest in TV technology in person before making a purchasing decision. Perhaps no other retailer understands this better than B&H Photo, one of the world’s largest non-chain suppliers of photo, video, and home entertainment systems. Located in New York City, B&H relies heavily on its giant 48-screen TV video wall, 17 screen TV gondolas and 40 projector demo area to present each at its best and move televisions and projectors out the door. Ensuring all the displays are performing at their peak, resolutions and image clarity are essential for their customers to make informed decisions. The B&H team knew that a new multi-format, in-store video distribution network was required. Staying ahead of technology is an ongoing mission for B&H, a company that prides itself on offering the most cutting-edge products in the industry. 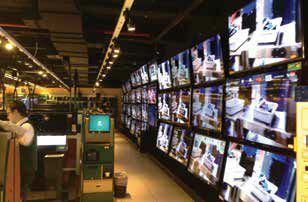 The main TV display wall in the home entertainment department consists of 48 TVs of varying sizes and resolutions, 17 TVs on gondolas, and a 40-projector demo area. As part of a major retrofit of the department’s infrastructure, B&H required an efficient and reliable AV system to distribute the 1080p HD content from single Blu-ray and media players to each screen and projector in the format required, as well as future-proof the wall to support 4K Ultra HD content. The system also had to down-convert for TVs and projectors that don’t support 1080p video resolution. “Every day hundreds of potential customers view displays expecting to experience the most advanced video resolutions available. The loss-less HD signal from the Blu-ray players combined with our professional staff allows us to recommend the perfect television or projector to our customers,” says Keith Cenname, display merchandiser for B&H. In the heart of the new B&H video distribution system, eight Atlona AT-HDCAT-8 2x8 HDBaseT Distribution Amplifiers in a cascaded configuration, each with eight category cable outputs, distribute a single Blu-ray player to Atlona AT-HDRX HDBaseT Receivers located at each TV in the video wall and on gondolas — with some located up to 100 feet away. The 40-projector demo area distributes HD video from a Blu-ray and media player via four Atlona AT-HD-V18 1x8 and one AT-HD-V116 1x16 HDMI Distribution Amplifiers. To reduce costs, system complexity and simplify installation, the AT-HDCAT-8 units deliver power to the AT-HDRX Receivers via Power over Category cable (PoCc) technology, eliminating the need for separate power supplies at each receiver. At each display, an Atlona AT-HDRX Receiver converts the connection from HDBaseT to HDMI. For displays and projectors with maximum resolutions lower than 1080p, the AT-HDRX Receiver passes the signal through an Atlona AT-HD550 HDMI Up/Down Scaler/Converter to optimize to the display’s native maximum resolution. Each low-profile receiver is located behind each TV, making it easier to change out displays as needed. The new video system offers a more immersive video experience to B&H customers and created a stronger sales tool for B&H staff. In the highly competitive world of electronics retailing, B&H knows it must master the art of the demo to generate sales success. Atlona solutions help deliver picture-perfect video quality across all displays and projectors in the system, regardless of their size, type or resolution.